A couple of months ago I posted two separate articles about the myth of Mike Ashley’s financial turnaround at Newcastle. Central to this was the ballooning debt since he took over, the static turnover, reduced commercial income, reduced match day income and the increased wages to turnover ratio. Three days in a row this week I’ve come across further (dis)information, some of which intensifies the myth around Ashley overtly, but also some that show the failings of the owner, albeit less explicitly. “The commercial side of our business will also be an important priority for us moving forward. While at the moment we can’t compete with the commercial strength of the top six, whose income from sponsorship and advertising deals dwarfs other clubs in the Premier League, we will work hard to drive up our commercial income to give ourselves the best possible chance of competing on the field with those wealthier clubs. Second, our old Chairman and disaster capitalist Freddy Shepherd has been whoring himself around the papers, sticking his nose in where it’s not wanted. His claim is that “Financially he has done a great job.” Like Charnley he doesn’t cite any evidence whatsoever to back up this claim, it just seems to be received wisdom. The news I’ve read that counters both men, comes in a series of Tweets from the Swiss Ramble. It’s a breakdown of all the main financial details from the latest accounts of every club in the Premier league. It allows me to bring those two articles bang up to date, and it still doesn’t look any better. In comparison to every other club in the league, Ashley continues to lose ground in commercial dealings for Newcastle United. 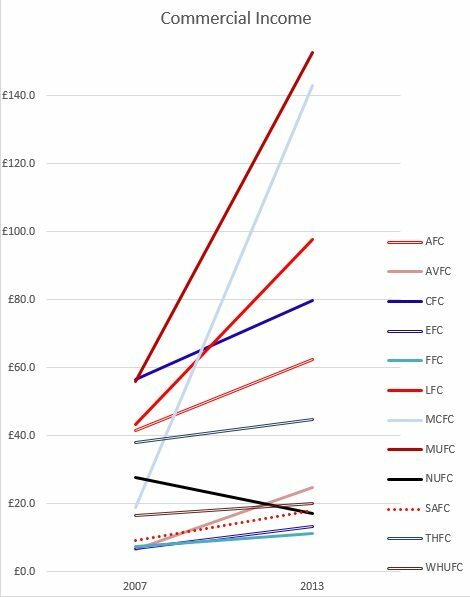 Newcastle United are the only club still earning less on the commercial front than they were in 2007. Income has reduced by £10m (one third). All the other Premier League regulars have grown their commercial income in that time. Similarly on the match day stream, Chelsea are the only other club to have shown any reduction to their income across the time Mike Ashley has owned Newcastle. Charnley attributes this to the club’s commitment to keeping ticket prices low. This is a bogus argument that puts the cart ahead of the horse. When Mike Ashley arrived there was no commitment whatsoever to cheap tickets. Nor was there the following season. It was only after the club were relegated that ticket prices began to fall. Only after promotion was there any ten year deals offered. This was the desperate act of a man who had chased away vast swathes of the Newcastle support and was taking any action necessary to ensure a full stadium. As Jackie Smithfield pointed out [intlink id=”41516″ type=”post”]in his Mag article[/intlink], the club have also previously stated the importance of driving match day income themselves. Making a complete farce of the current claim they have no power at all to grow it. Any Newcastle fan will tell you a dozen ways in which Ashley has messed up. Whether it was managerial appointments, those upstairs, lack of first team investment, selling our best talent, alienating fans and media and his own players to name a few. Specifically though, when it comes to Commercial and Match day revenue. The only two income streams Ashley can impact, as the club agree. Will he not act to reverse the trend? In a word, no. It is no accident. The two are intrinsically linked. Ashley uses St James’ park so that his Sports Direct brand is linked to a popular Premier League team, globally. 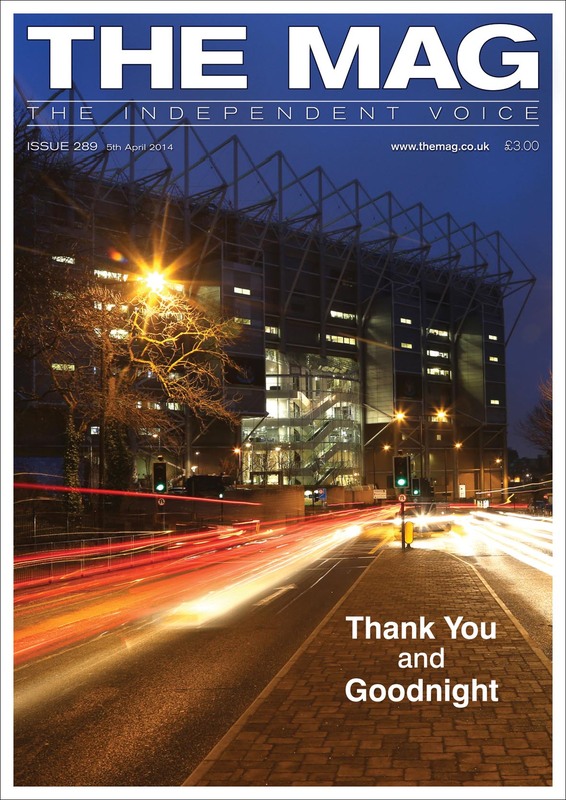 Newcastle United pay the cost of a dwindling commercial income in order to promote Ashley’s main brand, by design. 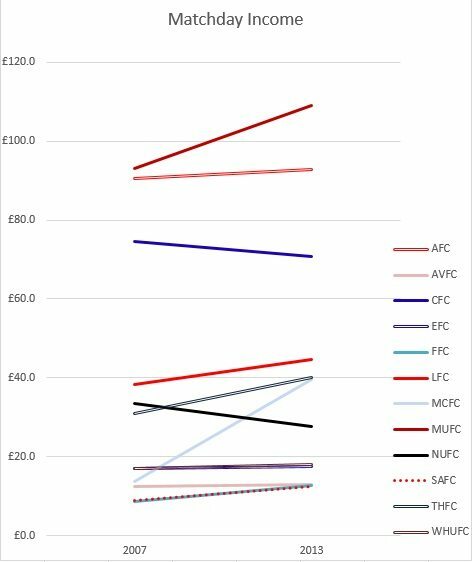 The reducing income from ticket sales, as more and more fans turn their back on the club, is no more of a concern than the commercial cost. The more people that jack in their match going, the lower prices will go. But Ashley won’t be too concerned, Newcastle United will just have to cut their cloth accordingly, the most important thing is the appearance of popularity on the world stage. Special Offer – To celebrate the new and final issue of The Mag we are offering FREE UK postage on this last issue, click HERE and you can order this final (collectors!) issue for only the £3 cover price. Another Special Offer – If there are any back copies you have missed out on then we are also offering FREE UK POSTAGE for those as well, click HERE to take advantage – while stocks last!